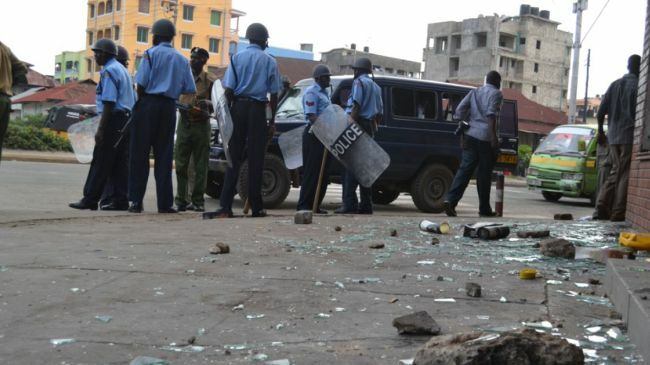 Fresh violence has erupted in the port city of Mombasa; four police officers were seriously injured after a man threw a grenade at a police vehicle along the cityâ€™s Kenyatta Avenue. The four police officers were in a group of seven officers attached to the Makupa police station, they were patrolling near a church compound in Lebanon area that has been a target of attack by terrorists. Three of the four police officers injured are scheduled for an operation at the Pandya Memorial Hospital. One assailant who was shot was rushed to Coast Provincial Hospital. Coast Provincial Police Officer Aggrey Adoli told local journalist that preliminary investigations had shown that the attackers hurled a grenade onto the police vehicle injuring officers on board. The attack follows two days of rioting sparked by the execution of terror suspect, a radical Muslim preacher Sheik Aboud Rogo by unknown gunmen Monday morning. The riots have left four people dead including at least two policemen; Police have intensified patrols in the city ahead of a visit by President Kibaki who is expected to preside over the official opening of this yearâ€™s Mombasa Agricultural show. The rioters are accusing the police of being behind Mr Rogo’s killing, saying he had been the victim of a “targeted assassination”.Â The police have denied involvement and instead pointed fingers at the Al Shaabab accusing them of killing the cleric in an attempt to galvanise support among the local youth. Mean while Police produced in court 24 people who were arrested on Tuesday in the riots, they were charged with taking part in an unlawful assembly and in a riot, they were remanded pending bail hearings. Mr Rogo was on US and UN sanctions lists for allegedly supporting the al-Qaeda-affiliated al-Shabab in neighbouring Somalia. Washington had imposed sanctions on financial transactions by Rogo over his alleged links to al Shabaab, and on five other individuals. The UN Security Council imposed a travel ban and asset freeze on him in July, saying he had provided “financial, material, logistical or technical support to al-Shabab”. It accused him of being the “main ideological leader” of Kenya’s al-Hijra group, also known as the Muslim Youth Centre, which is viewed as a close ally of al-Shabab in Kenya. Sheik Rogo faced terror related charges in the Kenyan courts of law. According to police, Rogo was arrested with firearms, ammunition and detonators in his house. He was accused of planning acts of terrorism. The case by the police against Rogo was still ongoing; Police expressed optimism that they had credible evidence that could have secured a conviction.